City University London has given an Award of Doctor of Science Honoris Causa to Terry Hill CBE, Chairman of the Arup Trust, for his numerous contributions to the global transport industry. The honorary degree was presented by Professor Dinos Arcoumanis, City's Deputy Vice-Chancellor (Research and International), at a recent Graduation ceremony for engineering and mathematical sciences students at the Barbican. Prior to his current role, Terry was Arup Group Chairman (2004-2009), responsible for the overall strategic direction of the firm, then Chairman - Global Transport Market (2009-2011), focusing on developing the aviation, maritime, rail and highways businesses and ensuring the delivery of the best transport projects to clients throughout the world. He has a background in civil engineering and economics and played a pivotal role in the Channel Tunnel Rail Link as Technical Director of London & Continental Railways Ltd. Speaking at the ceremony, Terry said: "My involvement with City, that most innovative of universities, is with its Collaborative Transport Hub, which aims to bring the brightest together to address one of the largest global challenges - making cities tick. Making the cog wheels of a city's transport system mesh. 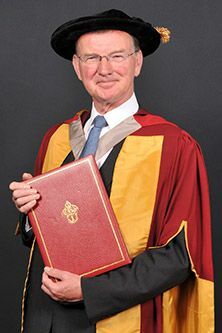 "The rate of growth of cities is such that we will have to build as much urban settlement in the next 40 years as we did in the last 7000, so I am thrilled and delighted to receive this honorary degree and I hope to be able, in a small way, to use it and my involvement here to help cities and indeed City University London." Professor Arcoumanis added: "Terry is well-known to academics at City since he is an important member of the Advisory Board of our Collaborative Transport Hub and has recently agreed to chair the fundraising committee for our new Sports Centre. "Terry's rise to the status of world expert in the development and implementation of infrastructure and transport strategies is due, according to his closest colleagues, to the combination of four qualities: outstanding technical competence, superb business acumen, self-confidence and well polished interpersonal skills. He is an excellent role model for our students."